Isme cellulite cream correction, removal of stretch marks and skin tightening. Cream, using a pronounced thermal effect, helping to get rid of fat cells, creating the "orange peel" - cellulite. The cream promotes the outflow of lymph and blood circulation improvement. 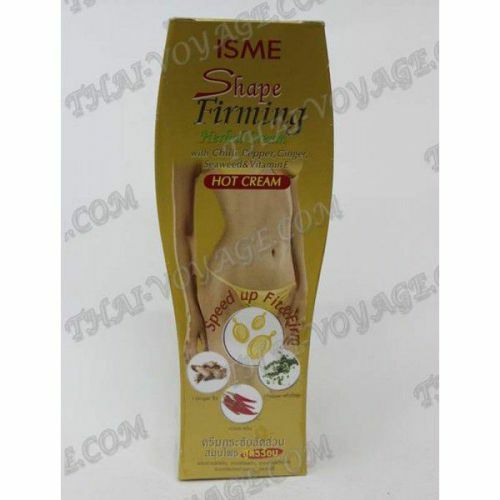 Anti-cellulite cream contains burning components: extracts of wild Thai herbs, ginger, chilli, black pepper, seaweed and vitamin E.
Ginger and chilli burn fat, increase blood circulation, collagen and Vitamin E smooth the skin of the body, reduce stretch marks, make the skin visibly toned and youthful. seaweed extracts help to effectively mitigate and moisture. Stimulates collagen synthesis in the skin tissues, improves skin tone and elasticity. The first results you will see in a week. Application: Apply the cream on problem areas (thighs, stomach). Massage movements rub the cream into the skin until completely absorbed. Do not rinse. Use twice a day, morning and evening. For quick results it is recommended to combine with a healthy diet, massage and sports exercises. Contraindications: individual intolerance, sensitive skin, pregnancy, lactation. ATTENTION! Perhaps a strong burning sensation on the skin! Experience the action of the pre-cream on a large plot no skin sensitivity.